Sarah walks out of a meeting with her customer. She has worked hard to build that relationship based on trust and honesty. But she has just had to lie to them, because she had to follow the company line. She sits back at her desk, and the company core values dance around her screen saver on her laptop. ‘Integrity’ is the one that leaves a bitter taste in her mouth. This morning David explained to his long term team member that, despite her difficult situation at home, the company had not been able to grant her request to work a four day week. Now he sits in a presentation and listens to his boss talk about the company’s focus on Employee Wellbeing. He curses silently under his breath. That’s how it feels to work for a company that plays lip service to its core values. Most value statements are bland, toothless, or just plain dishonest. And far from being harmless, as some executives assume, they’re often highly destructive. Empty values statements create cynical and dispirited employees, alienate customers, and undermine managerial credibility. 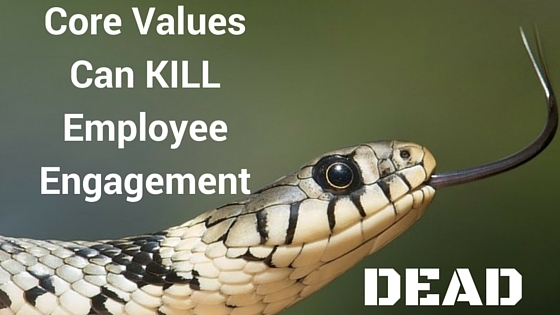 Of course, every organisation has values at the heart of their business. But publishing those values is telling the world that this is what a company stands by. And that should not be entered into lightly. Don’t get me wrong. A company that is truly driven by clear values can be a truly magnificent beast. Look at companies that are successful in the eyes of their customers and employees, and have a healthy bottom line. In a lot of cases you are likely to see a set of values that they hold firm in everything they do. But to get to that point takes a lot of work, dedication and some really tough decisions. And most companies think they know this and enter into it with the best intentions. They have a workshop. There is brainstorming, flipcharts and whiteboards involved until a list of values appears. But what about when these executives look at what drives their business and they don’t like what they see? And then nothing. Life goes on just as before. But the company now has ‘Core Values’. They can tick that off the list then. Do your values reflect where you are or where you want to be? When I was doing some research on this subject, I came across a brilliant article by Patrick M Lencioni in which he talks about the difference between Aspirational and Core Values. Core values being the ones that are already ingrained in the culture and aspirational values being those a company needs to succeed but currently lacks. And, I thought, maybe that is it. Wouldn’t you be more engaged with an organisation that admitted they were a little adrift from where they wanted to be. If they were bold enough to say this is what we believe our values should be but we are not seeing evidence that they are. So we are going to try and get there. That assessed how it was doing against these aspirational values. That was honest and public about its shortcomings. That said, for example, we are tracking well against integrity but we are really sucking with empowerment. That had a leadership team that led by example. That showed its employees what the behaviours behind these ambitious value statements looked like – and rewarded them for demonstrating them. How different does that feel to a company that puts it values on a poster and feels like they accomplished their goal? What is the secret to getting it right? There are several recurring themes from companies that are working hard to get this right. He uses the word ‘simply’, but that doesn’t mean it’s easy. Today is March 17th. For many companies, they are two weeks away from the end of a quarter. The pressure is really on to meet their financial targets. How much attention are they giving to their core values today? It is hard to hold tight to those core values when there are so many other competing pressures. Who is responsible for upholding the values in the business? Is there anyone that challenges decisions that are being made to ensure these values are being prioritised? Just as there is someone to review a decision to make sure it makes financial and operational sense, there should be someone to take on the role to assess it against your core values. Core Values that your company will live by shouldn’t be decided in one workshop. Take time to think about if they are really the right ones. Have you considered them against previous decisions made in the business? Would they have changed decisions you have made before? David Mammano, Next Step Publishing articulates well how his company developed the values from phrases to behaviours. If they are not prepared to make tough decisions in order to stick to these values. Then either don’t bother starting or change the leadership team. Therefore you have to bring in the right people, who share these values in the first place. For Location Labs, that meant holding training sessions for hiring managers to define what core values look like in an interview. And what about the existing team? There is always the guy that is a genius. Who works magic but is really hard to deal with. He doesn’t share the values and has no intention of adopting them. And he is normally commended, even though he is the antipathy of what the company apparently holds dear. One of the best ways to reinforce behaviours is to showcase where it is being done well. Recognise how your employees have demonstrated the values and reward them for it. Create a case study out of it. Communicate it to the whole workforce to reinforce that value. Share it during onboarding. Who wouldn’t want to work for a company that had values they stood by. Imagine looking at a company’s values and thinking yes, that is the type of company I want to work for. And feeling sure that is what it was going to be like. But to get to that point takes a lot of effort, belief and guts. If you are doing it because you think you should, that is probably not going to be enough. When there is too big a gap between what a company says it stands for and what it actually does, that is when your core values can become a poison running through the business. Perfection is impossible. And I can guarantee that companies that are genuinely driven by their values still don’t get it right every time. I guess that is where a value of ‘being honest with your team’ comes into play.